The below advertisement for the San Ysidro Ranch, which I pulled and scanned from an issue of Vanity Fair, presents a few problems. First, the image itself: If a hotel wanted to cater to an elite class of customers, then why would its marketers want the single graphic representation of the establishment to be a crudely drawn man and woman that don’t even look particularly like travelers? Seriously — look at them. I’d guess their creator was either a somewhat talented six-year-old or an adult artist trying to emulate a child’s drawing style but unwilling to ditch all pretenses of design aesthetic. I’m not one to rip apart kid’s art in the style of “Ding Ding! Here Comes the Shitmobile!”, but I’ll at least say that the graphic doesn’t make much sense, especially for an ad that ran in Vanity Fair. 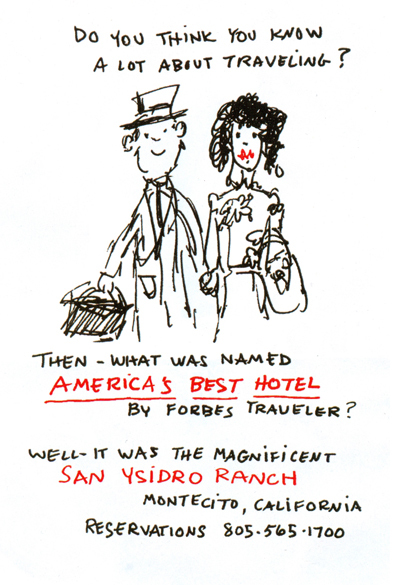 The there’s the message: The ad is trying to promote the San Ysidro Ranch in a way that suggests the hotel is good despite not being well-known. So why set up the communication of that message by implying that the reader is stupid? The ad asks a question — “Think you know a lot about traveling?” — to which the reader can answer either yes or no. Like a lot of other people who will probably never stay at the San Ysidro Ranch, I answered “no,” but I’d suspect that the hotel itself is more interested in the people who would answer “yes.” And a “yes” sets the reader up for a fall if he or she doesn’t know how to answer the question posed in the next line of text — “Then what was named America’s best hotel by Forbes Traveler?” Really, a person could know tons about traveling and could have never heard of the San Ysidro Ranch. Why tell self-described travel experts actually don’t know all that much, especially since they’d probably be the group most likely to take umbrage to such a slight? that is just bizarre. and beautifully roasted Drew. made me L the f out loud.